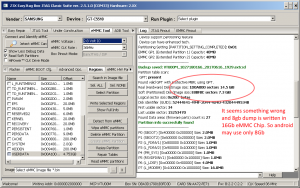 Guide for resizing GPT partitions | EasyJtag – Fastest Memory Programmer in the word! Next step is resize USERDATA partition; It still use 4.75Gb but can be much bigger so we need select partition for resize ( note: currently supported only last partition for resizing ) and resize partition dialog will appear. After few seconds partition have a new size. We need just format it from recovery or wipe from EasyJTAG suite.